I love the polka dot trend, which is taking over as my go-to pattern instead of stripes this season. 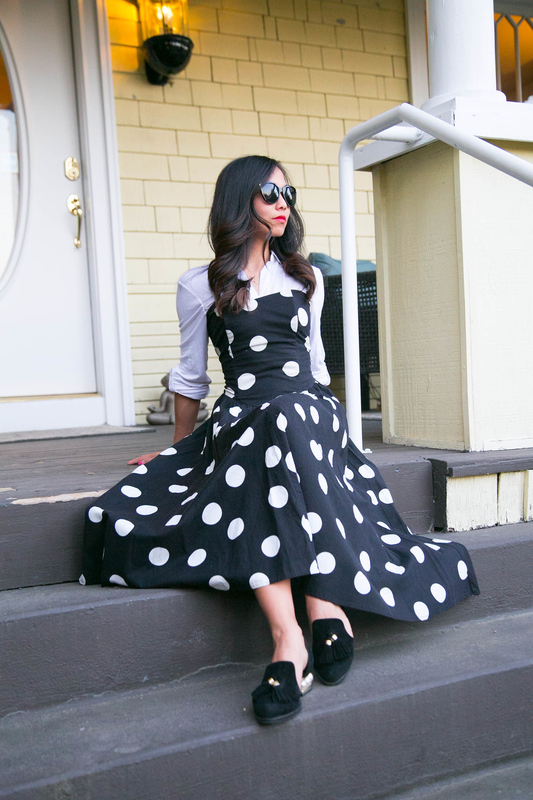 This polka dot dress is actually vintage. I’ve layered it with a blouse so that I didn’t need to bring a jacket out to dinner for when the temps cooled down after the sun set. These Jeffrey Campbell shoes are also probably my favorite. They aren’t too high-heeled so it’s easy to transition from office to dinner and stay on my feet all day. These photos were taken on the adorable porch of our Bed & Breakfast that we stayed in Seattle. If you’re looking for a charming place near Capitol Hill area, this is definitely the spot to stay! A great big dot dress 😉 And the shoes are gorgeous! I love vintage shopping! Thanks for reading!